‘A Volume Libraries - An Open and Shut Case’ is the title of the Spring Exhibition of classic English antique furniture at W. R. Harvey & Co, the Witney antique dealers, from 16-31 March 2019. The exhibition will highlight the quintessentially 'English Look' epitomised by the English Gentleman’s library of the 17th, 18th, and 19th centuries. A unique collection of pieces from across the reigns of 11 monarchs will illustrate the huge range of exceptional pieces that were designed and made for the libraries of manor houses, London residences and stately homes from circa 1680 to circa 1850. A superb set of mahogany library steps that transform from an elegant writing table to a practical set of steps with holding pole. Circa 1820. Many of these examples have been thoroughly researched and will reveal little known secrets that make them so interesting and desirable. The exhibition will be presented as a series of period room settings designed to emphasise the range of designs, colours, forms and uses of fine English furniture. A comprehensive catalogue will accompany the exhibition. 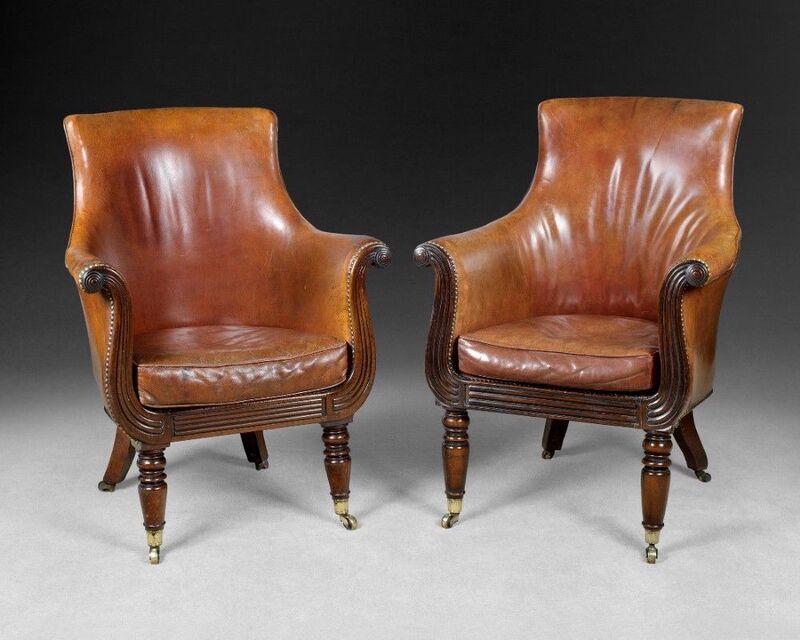 A wonderful pair of Regency library armchairs attributable to Gillows of Lancaster, dating from about 1815 to 1820. The front of the chair is in the form of a lyre supported on turned legs with brass cups and casters. A pair almost identical to these was supplied to the 2nd. Baron Bolton and came onto the market in 1988 as part of the Hackwood Park sale as lot 55. They were also upholstered in leather. The library was so much more than somewhere where books were kept. Visitors have the opportunity to see the progression in styles from the walnut pieces of the James II/ William and Mary period to the rosewood of the Regency. Examples include a wide selection of elegant bureaux and library tables, intriguing metamorphic pieces and bookcases of many different sizes and shapes. Chairs, clocks and other pieces regularly found in the library are included in the exhibition. 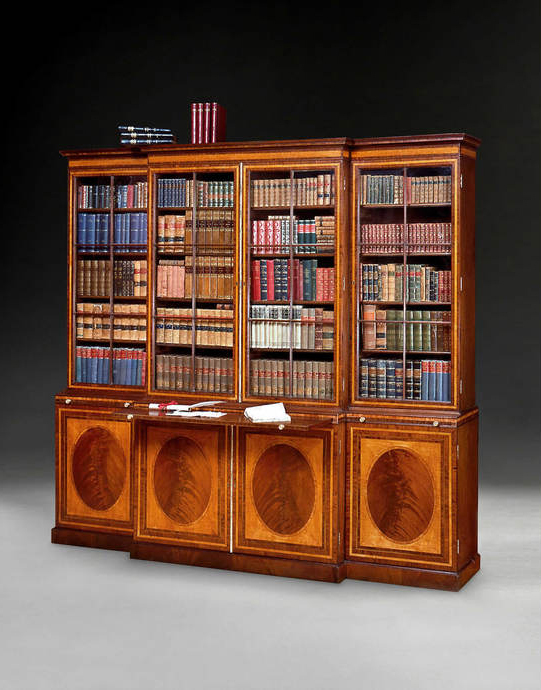 A magnificent George III breakfront library bookcase. As the history of English furniture reveals, so many different woods, sourced from all over the world, were used by cabinetmakers, craftsmen and artisan joiners to produce the finest furniture in England’s history. Today, fine and practical pieces are sought after, admired and in daily use in so many homes. Now antique furniture is back in vogue, appreciated for its quality of craftsmanship, practicality, decorative qualities, longevity and its new affordability. The names of children and possibly adults who carved and scratched their names and initials on to the back of a piece of furniture have been discovered on the underside of an antique table featured in the exhibition. 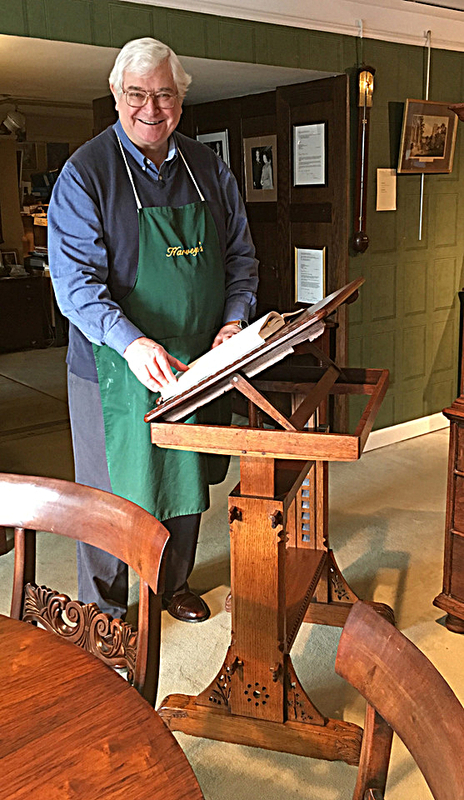 David Harvey of WR Harvey & Co. from 86 Corn Street, Witney with the reading table. 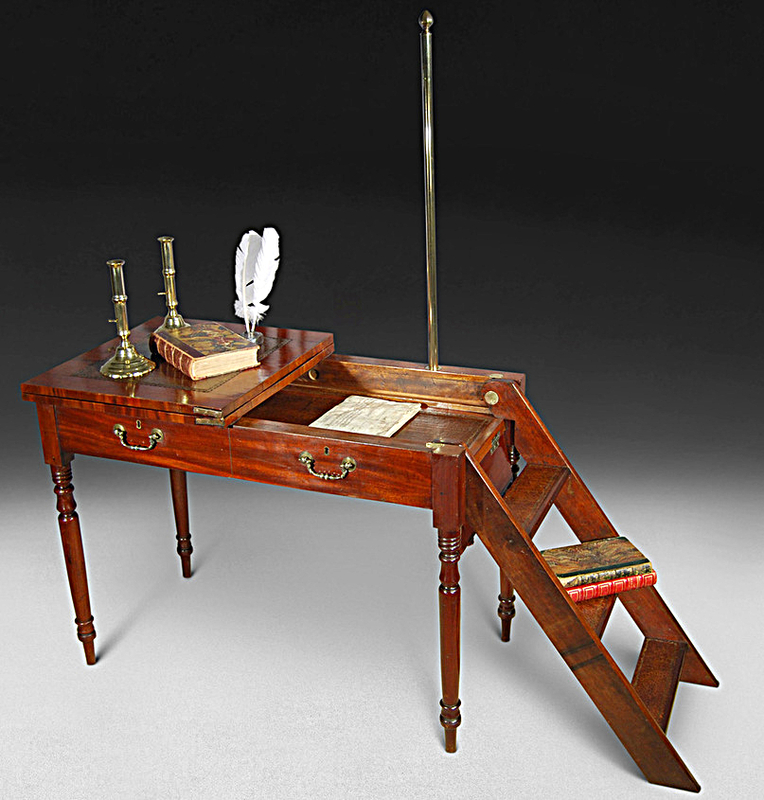 The late 19th century adjustable oak reading table. The rare late 19th century adjustable oak reading table is described as Arts & Crafts in origin. 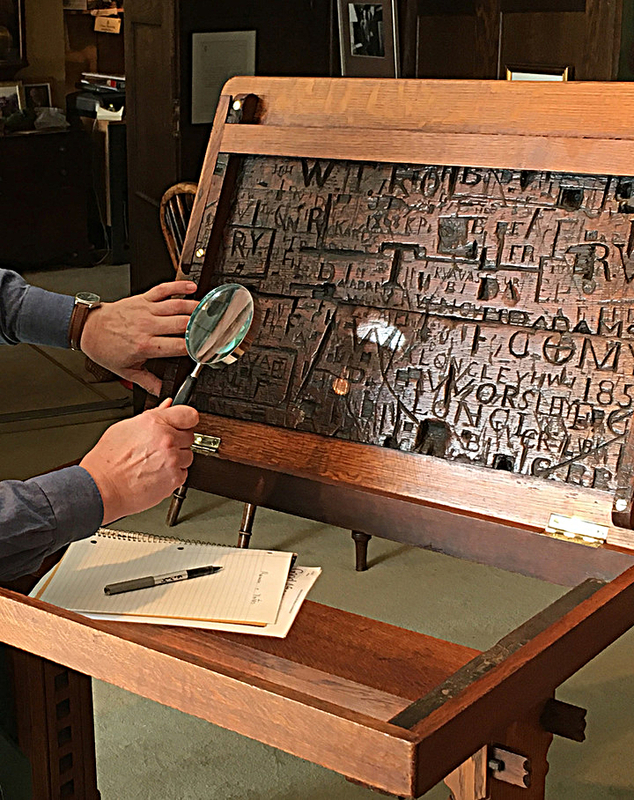 It revealed its surprise beneath the easel top where the darker wood is deeply scratched with carvings of names and dates. The whole top of this table was recycled in about 1880 from an earlier item. Although its origins are unknown, David Harvey suggests a church pew - bored altar boys sitting in a church and carving their names onto the back of the pew in front of them. Who were these people and what are the dates? The name Worsley is clearly etched – Lucy Worsley’s ancestor perhaps? Where did this come from and how did it go undiscovered? The table is in excellent condition, retains its characterful secret and is available for £2,750. David Harvey told ANF: "Harvey’s pioneered exhibitions of English library furniture more than 30 years ago, so I am delighted to be returning to the theme. This is a very exciting exhibition that brings together so many different elements of English furniture design from its most classic period. We look forward to welcoming collectors and anyone interested in examining and enjoying an often-neglected aspect of interior decoration that was once so important to the way we aspired to enjoy life." The Spring Exhibition is open 10am-5pm daily to the public. Witney, Oxfordshire, OX28 6 BU.